African Violet. Photo courtesy Michael Krefft/stock.xchng. The green lushness of houseplants bring life into a room, literally and figuratively. As ornamental as houseplants are, many also provide health benefits by purifying the air and increasing humidity in the dry chill of winter. Flowering houseplants add another layer of enjoyment, bringing color and maybe even scent into your decor. Many people shy away from houseplants because even the most hardy houseplant will eventually require some care. But you would be surprised at how a handful of plants can survive on the most minimal attention. If you'd like to try your hand at growing plants indoors or you're looking to brighten someone else's abode, here's a selection of houseplants that will thrive with minimal care and in varying degrees of sunshine. Every home has an African violet in it at some time. They seem to flourish for years and then give out without warning. They are favorites because they don't require a dormant period and can keep blooming year round. And you can find flowers in shades of purple, white and red. 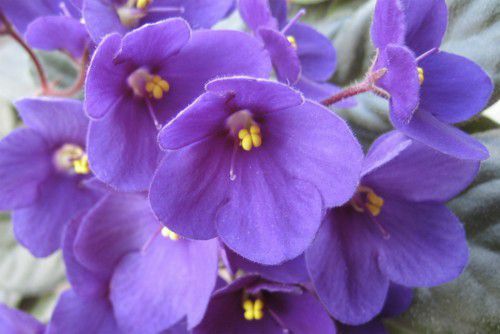 Light: African violets prefer a spot with indirect sun all day, but will bloom with considerably less exposure. Morning light is better for them than hot, afternoon light. Water: Keep the soil evenly moist, but not wet. Too wet and they'll rot. Too dry and they won't flower. Don't worry, you'll find a balance. Fertilizer: Because they are such profuse bloomers, feed whenever you water. There are special African violet fertilizers, but any water soluble fertilizer for flowering houseplants would be fine. Temperature: Typical house temperatures of 65 - 80̊F are perfect. They may slow down a bit in the heat of the summer, but then, so do you. Additional Tips: Water from the bottom of the pot. African violets don't like to get their leaves wet. (How do they survive in nature?) There are special African violet pots that have a slow release reservoir that wicks water up from under the soil. These work well, but you can just as easily set your pot in a saucer of water until the water is absorbed. Cold drafts will cause the flowers and buds to drop and intense direct sun will burn the leaves. Begonia Flowering Houseplant. Photo courtesy Alfred Borchard/stock.xchng. You may be used to growing begonias outdoors, but they make excellent houseplants, blooming almost continuously in good conditions. Some of the fancier-leaved varieties don't even need to be in bloom to be color. Look for the fibrous rooted types like wax-leafed, angel-wing and hairy-leafed varieties. Light: Indoor begonias can take a bit more light than when planted outdoors since the light is diffused. So place them near a sunny window, for optimal blooming. Water: Allow the surface of the soil to dry out between waterings. Fertilizer: Feed every 3-4 weeks, to keep them in bloom. Temperature: Begonias prefer cooler temperatures, but should be happy as long as the temperature doesn't swing to extremes. Additional Tips: Begonias are extremely carefree. They light to be slightly pot-bound, or tight in the pot. Bromeliad. Photo courtesy Craig Jewell/stock.xchng. These quirky looking plants are members of the pineapple family Most are epiphytes or air plants, but can be grown in containers and require little care. You can encourage bud set by placing a plastic bag over the plant and enclosing it with an apple. The ethylene initiates budding. Once it starts blooming, it can go for months. Some varieties also have colorful foliage, adding to the display. Light: Bright light. Generally the brighter the light, the brighter the flower color. However, bromeliads don't like to bake in​ the hot sun, so use some discretion during the summer. Water: Water by letting the water collect in the cups between leaves. It will eventually get absorbed. Fertilizer: Don't feed during the winter months. Mixing a little-controlled release fertilizer into the potting mix in spring is probably the best option since you'll be watering the foliage and a water soluble fertilizer could build up and burn the leaves. Temperature: Most bromeliads are tropical or subtropical and like temps in the 70 - 75̊F during the day, dipping down to 60 - 65̊F at night. A high humidity (40 to 60 percent) will also make them feel at home. Additional Tips: Plant in a shallow container with a course potting mix for good drainage. Something with bark pieces in it would be perfect. You want to anchor the plant, but still allow good aeration. Christmas Cactus (Schlumbergera x buckleyi) Christmas Cactus. Photo courtesy Meve13/stock.xchng. Christmas cacti seem to thrive on neglect. They don't even need you to manipulate their light exposure to set buds for Christmas blooms. They are especially long lived and propagate easily from cuttings. Light: They prefer a diffused light, although I have seen them sitting in a bright chilly window blooming profusely. Water: Allow the soil to dry completely between waterings. Never let the soil sit wet. Temperature: Christmas cacti aren't fussy about temperature. Ideally, they like it warm 70 - 80̊F during the growing season and cooler 55 - 65̊F while setting buds. But unless you're having difficulty getting your plant to bloom, I wouldn't worry too much about temperature. Additional Tips: They don't like sudden drafts and will drop their buds or flowers if exposed. Keep away from frequently opened doors. Clivia or Kaffir Lily. Photo courtesy Charlene Sprong/stock.xchng. This amaryllis relative is also grown from a bulb and like it's cousin, needs to be pot bound to flower. Also like the amaryllis, Clivia go through a dormant period before sending up a flower stalk. They'll need total darkness at night when they go dormant in late fall. The stalk will sprout anytime from December through April and normal care can be resumed. Flowers are usually some shade of yellow or orange. Light: Low to Bright light. Clivia will do best in dim light, but a bright location is fine, as long as it is not direct sunlight. Intense, direct sun will burn the leaves. Water: Water when the soil feels dry. Withhold water during the plants rest period (usually around November) and resume watering when the flower stalk appears. Fertilizer: Feed every other week while actively growing (spring/summer) with a diluted water-soluble fertilizer. Temperature: Clivia likes average home temperatures except during its dormant period when it needs temperatures in the 50s F. To produce flower buds. Additional Tips: Clivia can get top heavy when in flower, so be sure to use a heavy pot. They like to be pot bound, but repot when you see the roots pushing out the top of the pot. Peace Lily. Photo courtesy xymonau/stock.xchng. The Peace lily is a great houseplant for the houseplant challenged. I guess that's why it's so popular as a housewarming gift. The glossy, dark green leaves are offset by white spathes or bracts that enclosing the tiny flower clusters and look almost like variegated leaves. I've heard claims that the flowers are lightly scented, but I can't say I've noticed. Still, how many other plants flower in the shadiest of homes? Light: Peace lilies actually prefer a bright, diffused light, but since they tolerate low light and very few flowering plants do, they have become known as a low light plant. Water: Allow the soil to dry between waterings, but keep an eye on it. If the soil is dry for too long, the leaves will start to yellow and drop. Fertilizer: Feed every other month with a diluted water-soluble fertilizer. Repot every 2-3 years with fresh soil. Temperature: Typical house temperatures of 65 - 85̊F are ideal. They can handle it a bit cooler at night. Additional Tips: Peace lilies are listed as one of the best air purifying houseplants. Peace lilies can be sensitive to chemicals in water. Try not to get water on the leaves. Bottom watering, as with African violets, is a good choice. Peace Lilies are becoming popular with hybridizers. Some new varieties to be on the lookout for include: profuse blooming "Flower Power" and variegated "Domino". Sometimes it's best to rely on foliage rather than flowers for color in low light rooms. Good choices would be caladiums, shade coleus, and rex begonias.